Did the Governor of Colorado Lose Pikes Peak in a Football Bet? Bets between politicians are a common tradition in the world of professional sports. In 2010, before the Major League Baseball (MLB) World Series began between the San Francisco Giants and the Texas Rangers, San Francisco Mayor Gavin Newsom made a bet with Arlington mayor Robert Cluck that the mayor of the losing city has to travel to the winning city to do a day of community service wearing the jersey of the victorious team. In addition, had the Giants lost, Newson would have had to send to Cluck some Ghirardelli chocolate, sourdough bread, Dungeness crabs and some Anchor Steam Beer. If the Rangers lost, Cluck would have had to send to Newson some BBQ from a local place called Spring Creek BBQ. Similarly, Speaker of The House Nancy Pelosi made a bet with Arlington representative Joe Barton. If San Francisco won, Pelosi would receive a Pecan Pie from Corsicana's Collin Street Bakery. If Texas won, Pelosi would send some of San Francisco's finest Ghirardelli chocolate. So this is a common tradition. But in 1938, did the Governors of Texas and Colorado take this tradition to the next level? Did they actually bet national landmarks on the results of a football game? Teller Ammons was born in 1895 to Elias Ammons, who served one two-year term as the Governor of Colorado from 1913-1915. In 1937, the younger Ammons followed in his father's footsteps. Teller Ammons served as the Governor of Colorado for one two-year term of his own. After he lost his re-election bid, Ammons worked as a lawyer for the rest of his life (he was Denver's city attorney directly before becoming Governor). At 42 years old, Ammons was a fairly young Governor. James V. Allred was even younger when he became the Governor of Texas in 1935 at the age of 36! Allred (the V. stood for nothing -- it was a mistake when he enlisted in the Navy in 1918 that he liked enough to keep for the rest of his life) was a popular Texas attorney who, at the age of 31, became the youngest person ever elected Attorney General of Texas. Allred was an ardent supporter of President Franklin Delano Roosvelt, and was rewarded with a federal judgeship after his two terms as Governor of Texas finished in 1939. He resigned in 1942 to try to unseat the conversative Democractic Senator from Texas, W. Lee O'Daniel (who had followed Allred as Governor). After failing to do so, Roosevel tried to get Allred back as a federal judge, but the Senate Judiacry Committee refused to confirm him in 1944. In 1949, though, President Harry S. Truman (who shared a middle name, of sorts, with Allred) again nominated Allred, and this time Allred was confirmed. He served as a federal judge until his death in 1959. Allred was well-known for his love of publicity stunts designed to attract attention to Texas. His most famous stunt occurred after the 1938 Cotten Bowl, which saw the University of Colorado Buffalos face off against the Rice University Owls. The Cotton Bowl was formed just a year earlier, as Texas oil executive J. Curtis Sanford financed the first game out of his own pocket. He lost money that first year, even though 17,000 people saw TCU defeat Marquette. The 1938 game, though, saw 37,000 attend and the game made money and has become a college football institution ever since. In any event, before the game, Allred and Ammons made a rather unusual bet on the game. Ammons bet Colorado's famous mountain, Pikes Peak (the peak that inspired the song "America, the Beautiful") and Allred bet Texas' Big Bend Country. Rice won the game 28-14, so Allred has successfully "won" Pikes Peak. A popular joke in Texas at the time was that Allred was the first Texas Governor to actually ADD territory to Texas! So on October 20, 1938, Allred traveled to Colorado to claim his prize. He went to the top of Pikes Peak and after a short address placed the Lone Star Flag into a snow drift, thereby claiming the mountain for the state of Texas. 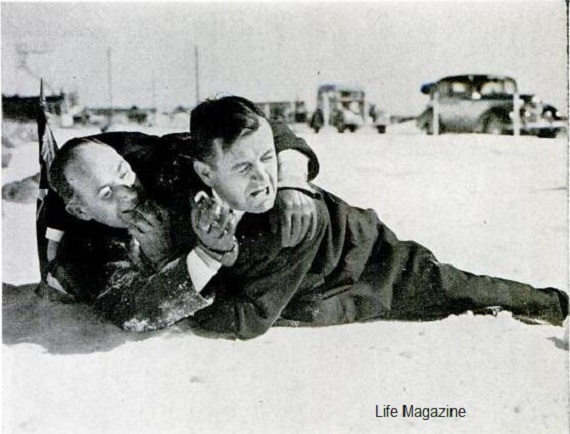 Amusingly enough, the two Governors playfully began to wrestle in the snow before the flag was planted (Life magazine was not amused at the time, noting that the pair had set a new record for gubernatorial lack of dignity). Be sure to check out my archive of Football Legends Revealed for more urban legends about the world of football.